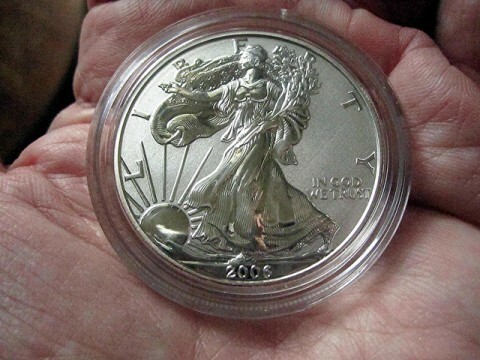 Coin collectors and investors alike love buying American silver eagle coins, which are easily accessible and quite affordable for most people who want to invest in precious metals. In fact, silver eagles are sold by coin dealers just about everywhere and uncirculated — or bullion — versions are usually offered for only $3 to $4 over the current spot price of silver. But did you know there are plenty of ways to buy American silver eagles at discounted prices? So, what are some of the ways that you can buy cheap American silver eagle coins? It seems that one of the best ways to save money these days is to buy things in bulk. The same applies when buying silver eagles, too. Though not all coin dealers offer bulk discounts on silver eagles, many do. Often, the discounts start on orders of 20 or more American silver eagles, and the savings tend to increase with larger order increments. So, if you plan to buy more than a few silver eagles, be sure to shop around and look for coin dealers and silver brokers that offer discounts on bulk orders. Unfortunately, not everyone handles their coins in the correct way. Sometimes, accidents happen and an errant finger slips across the surface of a coin, leaving behind a smudge that looks worse over time. In other situations, coins wind up in the hands of those who simply don’t know how to hold coins properly. In any case, many coins end up with unsightly marks and other imperfections due to the way they’ve been handled or stored, causing those coins to lose their value. Many silver eagle coins have problems due to mishandling, and coin dealers often sell these problem pieces at cut-rate prices to help move them out of the shop a little faster. So-called cull American silver eagles are great purchases for those who are buying silver eagle coins solely for the sake of their bullion content and want the best bargains. Have anything you don’t need anymore? Maybe pins, war memorabilia, even old photos? There are people out there who may be willing to trade their collectibles for yours. The chances of finding someone who will use American silver eagles for barter are even better when silver prices are low or are on a long-term downward trend. Often, these individuals had bought their silver eagles when bullion prices were relatively high and would otherwise take a hit if they sold their silver coins on the market with the lower silver prices. Ever notice that auction coins sometimes trade hands for less than their book values? It happens all the time, and it’s often the case with coins that sell on eBay. Of course, many coins sell for much more than their common retail values, too. The beauty of an auction is that you name your bid, and maybe you’ll win the item you want at the price you were hoping for. Thousands of American silver eagle coins are listed on eBay at any give time, so check it out and see if you can find some 99-cent or no-reserve auctions to bid on — just 2 ways that you could easily snag some cheap silver eagles. This suggestion is sort of a “hidden” discount for buying silver eagle coins, but it does save real cash. Before you start buying silver eagles, be sure to join mailing lists for the coin dealers you wish to make purchases from. Often, dealers and bullion brokers run specials for free shipping, which is a popular offer around major holidays. If you see such an offer, be sure to take advantage of it if you can. The $5 or $10 you save on shipping is indeed real money and especially makes a significant discount on smaller orders. Many coin dealers run special offers, like 10% or 15% discounts on orders over a certain amount of money. Of course, these discounts don’t always apply to bullion coin orders, but some are perfectly valid no matter the type of purchase they’re used for. Sometimes the only way to grab coupon codes for American silver eagles and other coins is to subscribe to a coin dealer’s mailing list, so be sure to sign up with any dealers that offer free membership.